Maybelline Dream Lumi Touch Highlighting Concealer: A brighter idea in concealers, the gel-based formula diffuses light to provide on-the-spot perfection in just one touch, illuminating as it conceals. Dermatologist, allergy Tested, noncomedogenic, and suitable for sensitive skin and for all skin types. As I mentioned earlier, the Maybelline Dream Lumi Touch Highlighting concealer features a pen-style packaging with a brush at one end and a twisting mechanism to dispense the product at the other end. When using for the first time, you do need to twist the end a couple of times (not a couple of clicks - a couple of rounds), but after that a click or two is sufficient to dispense the product. The actual product/concealer takes up only about half the space in the pen while the rest of the space is occupied by the twist-dispenser. The packaging scores high in terms of being compact, travel friendly, and extremely convenient to use. You do have to remember to wipe off any extra concealer from the brush (I use a regular makeup wipe) after each use or it tends to dry and cake up on it over time and it gets difficult to get product out after that. I had already used the concealer twice or thrice when I took the photo, so the actual amount will be a little bit more than this. There is no shimmer in the product, but it brings a degree of lightness to where it's applied. Now that I am done describing the product, I will move on to actually using this product. 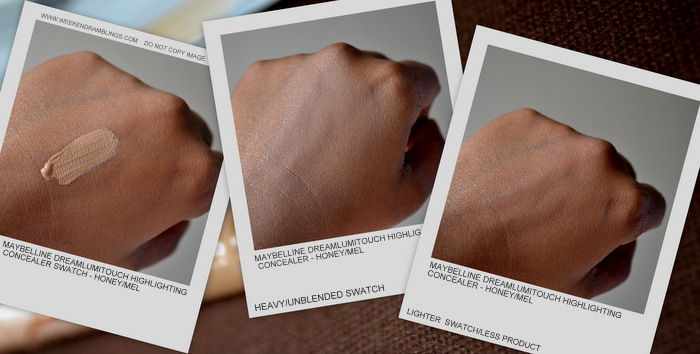 Since the Maybelline Dream Lumi Touch is an illuminating concealer (and not really a concealer that you would use to cover up major blemishes), this concealer is meant to be used on areas where you want to get rid of some darkness like the under-eye area, sides of the nose, etc, and to even out minor imperfections. Here's how I actually use this product: To use the concealer, I actually mix it with my foundation to get it to a shade I find suitable - I want the concealer to be just a shade lighter than my regular foundation, and mixing equal parts of the foundation and the concealer works for me. If you get an appropriately matching shade, you could skip this part. I use a brush to place the concealer at the areas that need it, but I use my finger and patting motions to actually pat the product into my skin. I find it easiest to blend this way. Mixing the concealer on the back of my hand also helps to get the product slightly warmed up (from the warmth of my skin) - helps the concealer go on more easily on to the skin when I apply it. I have added the concealer to my under-eye area, sides of the nose, corner of mouth, along the upper lip area, and a bit of the leftover concealer to the brow bone and to the top of the nose to even out some patchiness. I thought my eyebrows looked a bit bald when I was done :P...so I filled them in just a teeny bit, but apart from that there's nothing else I have added on to the rest of my face makeup. 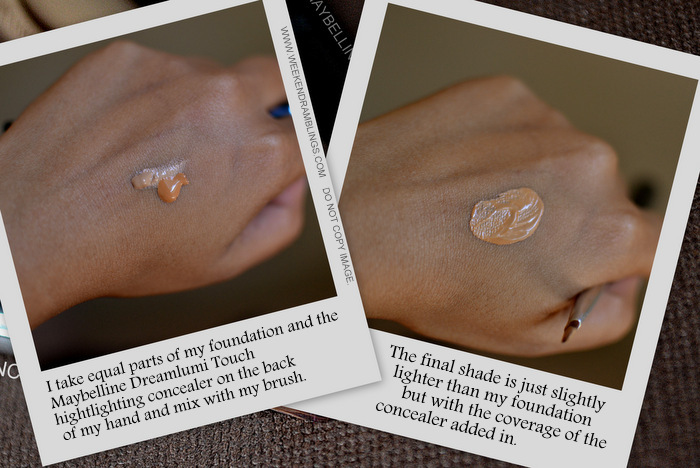 My Thoughts on the Maybelline Dream Lumi Touch Concealer: When it comes to makeup, less is more for me. I am not comfortable piling on a lot of makeup, and all I look for is something to keep me looking reasonably polished and neat. I need makeup that looks natural in the day light, and this Maybelline concealer meets all my needs and more. It does a good job of lightening my dark circles without looking caked on. 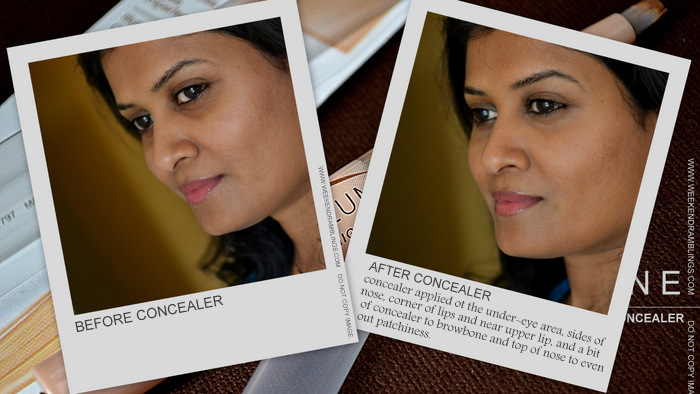 It's easy to apply and stays on without settling into the creases that I have around my eyes. All the dark crooks and crannies on my face get sorted out, and I can just use a tinted moisturizer for the rest of my face. Needless to say, I absolutely LOVE this product! I haven't had issues with the staying power, but two things that might help in case you need: Apply a primer to the under-eye area before you apply the concealer and after you are done applying the concealer, set it with some powder. Hey Rads, love the before and after pics.. shows the difference very clearly.. liked the way you used it. I have been getting all mixed reviews about this product and your review gave me a clear idea now. Its a very nice review.I think I should try this one but if this shade is too orangy or tan than I will skip it.This is not launched in my country so I'll be ordering it online...I want something that is more yellow toned. Oh I have to try the Clinique one then! Does it have a better shade selection? Also I like your lipstick too.. Which color is this?